w/Camera mirror:The timing of the change between high beams and low beams differs depending on the light transmission rate of the glass. 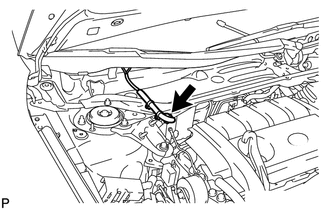 For this reason, when replacing the windshield, replace it with an original equipment part. 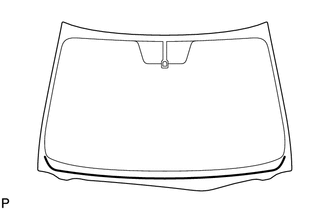 (a) Slightly lower the front section of the roof headlining assembly so that the windshield glass can be removed. 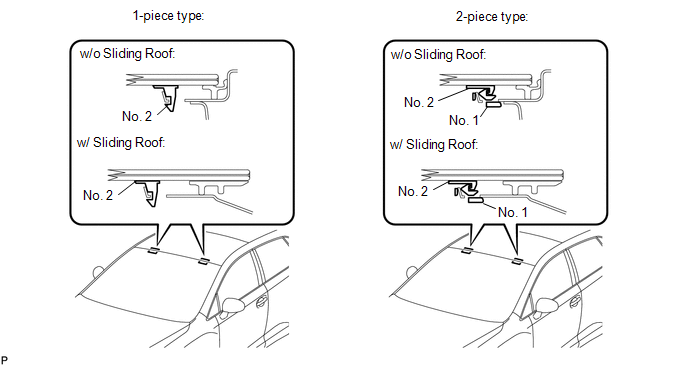 It is not necessary to completely remove the roof headlining assembly. 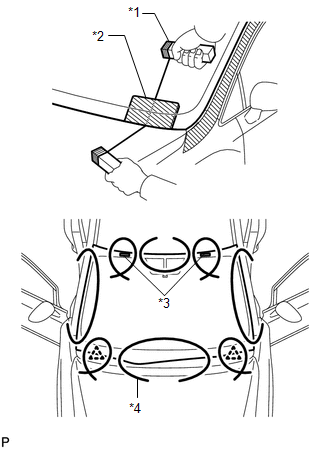 (b) Apply protective tape to the installation position of the windshield glass on the vehicle body. Apply protective tape to the installation surface to prevent it from being scratched. 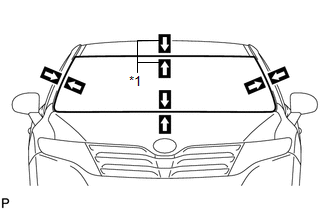 (c) Pass a piano wire between the vehicle body and glass from the interior, as shown in the illustration. (e) Cut off the adhesive by pulling the piano wire around the windshield glass. When separating the windshield glass, be careful not to damage the paint or the interior and exterior ornaments. To prevent the safety pad from being scratched when removing the windshield glass, place a plastic sheet between the piano wire and safety pad. 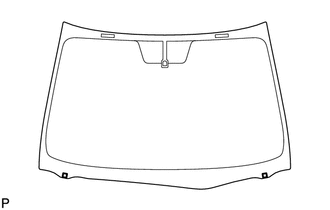 (f) Place matchmarks on the windshield glass and vehicle body on the locations indicated in the illustration. Matchmarks are not necessary if the windshield glass is not going to be reused. (g) Disconnect the 2 guides. (h) Disconnect the windshield glass stoppers. There are No. 1 and No. 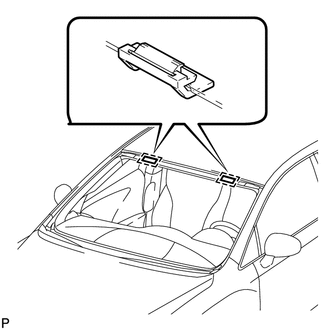 2 stoppers on the windshield glass as shown in the illustration. To prevent the windshield glass from dropping when performing this operation, be sure to hold the windshield glass using suction cups. Depending on vehicles, 1-piece or 2-piece type stoppers are used. (i) Using suction cups, remove the windshield glass. Be careful not to drop the windshield glass. Leave as much adhesive on the vehicle body as possible when removing the windshield glass. 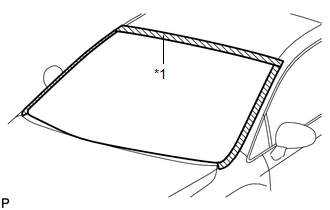 (a) Using a scraper, remove the window glass adhesive dam. Be careful not to damage the windshield glass. Be sure to replace the window glass adhesive dam with a new one. 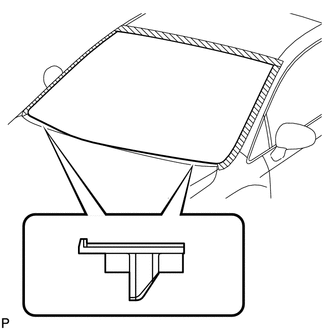 (a) Using a scraper, remove the 2 windshield glass retainers. 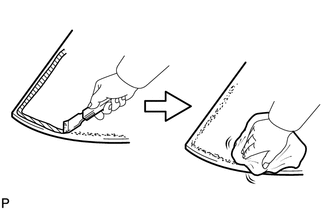 (a) Using a scraper, remove the 2 No. 2 windshield glass stoppers. Be sure to replace the No. 2 windshield glass stoppers with new ones. 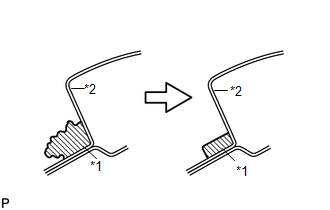 (a) Remove the 2 No. 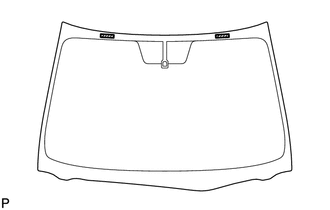 1 windshield glass stoppers as shown in the illustration. (a) Using a scraper, remove the adhesive tape and adhesive sticking to the windshield glass. (b) Clean the outer circumference of the windshield glass with a non-residue solvent. Do not touch the windshield glass surface after cleaning it. Even if using a new windshield glass, clean the windshield glass with a non-residue solvent.